Today, after our last night in Jerusalem, we drove south to Kiryat Gat. Our goal was to tour one of Intel's fabrication plants. Along they way, the terrain changed from arable mountains to hot deserts. 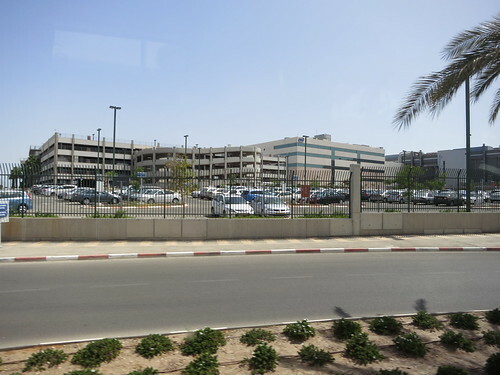 Intel, Steve's former employer, choose to build a plant in Kiryat Gat because the government offered attractive tax breaks under the condition that the plant be placed in Kiryat Gat. This was in the Israeli government's interest because, at the time, Kiryat Gat had a high unemployment rate. History has proved the government correct since the first Intel fabrication plant - unemployment has become low and HP, Microsoft and Micron have opened offices in Kiryat Gat. Today, after our last night in Jerusalem, we drove south to Kiryat Gat. Our goal was to tour one of Intel's fabrication plants(Fab 28 to be exact). Along they way, the terrain changed from arable mountains to hot deserts. Intel, Steve's former employer, choose to build a plant in Kiryat Gat because the government offered attractive tax breaks under the condition that the plant be placed in Kiryat Gat. This was in the Israeli government's interest because, at the time, Kiryat Gat had a high unemployment rate. History has proved the government correct since the first Intel fabrication plant - unemployment has become low and HP, Microsoft and Micron have also opened offices in Kiryat Gat. Photos were strictly forbidden on Intel's property. We went into the aquarium, a cube with windows on all sides inside of the clean room, and saw the technicians, in white tyvex suits, upgrading machines while transportation robots whizzed along tracks on the ceiling. The robots autonomously complete the fabrication of Intel's chips. One new machine, to produce Intel's new 22nm technology, was being set up during our tour. Similar machines covered the five-football field sized plant. The cost for one of these machines is 80 Million dollars. These machine along with the robots work 24 hours a day for 364 days every year (only of Yom Kippur it work halted). The precision, automation, complexity and size of what we saw was breathtaking. 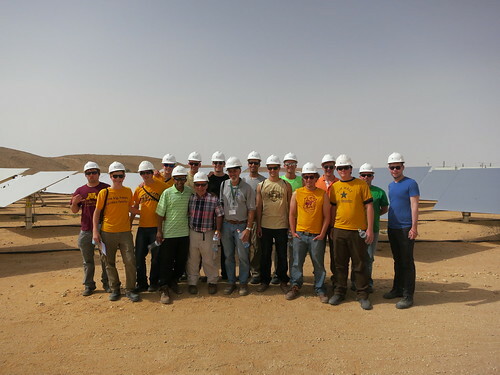 Next, we drove into the Negev for a visit with BrightSource, a solar power plant designer. BrightSource is developing solar power plants that will be sold to utility companies. In Rotem Industrial Park, where we visited, the company has their Solar Energy Development Center. Among other experiments, the facility has a 6 MW solar thermal demonstration plant made up of over 1,600 mirrors and a 60m tall tower. The plant, in broad strokes, uses focused sunlight to heat steam to over 1000 degrees Fahrenheit and uses the resulting dry steam to run a turbine. We walked out into the solar field and saw how two axis motors on each pylon kept the mirrors oriented for maximum reflection onto the boiler in the tower. We continued in the Negev to the Dead Sea. In the south end of the Dead Sea we dipped into the water. Floating in water felt much different than imagined. 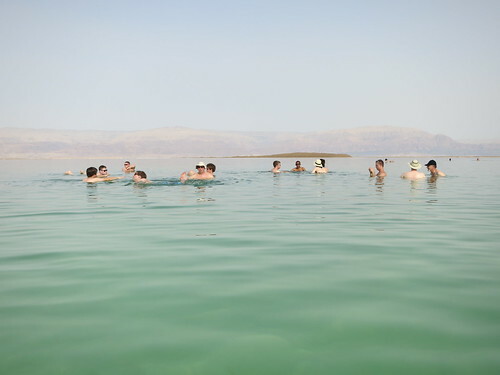 We took our time relaxing in the blue water before heading to the Masada Guesthouse to sleep.